Need more information about booking Home 10569 ? A spacious (50sq m) and comfortable studio with mostly solid wood, Thai style furniture, luxury porcelain bathroom, air-conditioning, balcony with partial ocean views, built in kitchen with black granite worktop. 200m from two pretty beaches. A good selection of bars and restaurants within walking distance and Pattaya centre around 2 miles away. Lovely communal gardens and pool with fountains and bridge to central jacuzzi feature, resident's and guest's gym, convenience store and cafe all form part of the development. Perfect for a romantic beach getaway for couples who want to dip their toes in the fantastic shopping and nightlife of Pattaya and then return to a calm and relaxing retreat at the end of the day. A 32" flat screen TV is installed with a choice of cable programmes in different languages. A selection of DVDs has been provided, others may be purchased locally at very cheap prices, CDs also play on the DVD player. A safety box has been installed. Tastefully furnished in traditional style, the apartment is on the 4th floor (lift access) and enjoys sea breezes and sunset views. This condominium residence is in a relatively quiet yet upmarket area close to a handful of prestigious hotels. 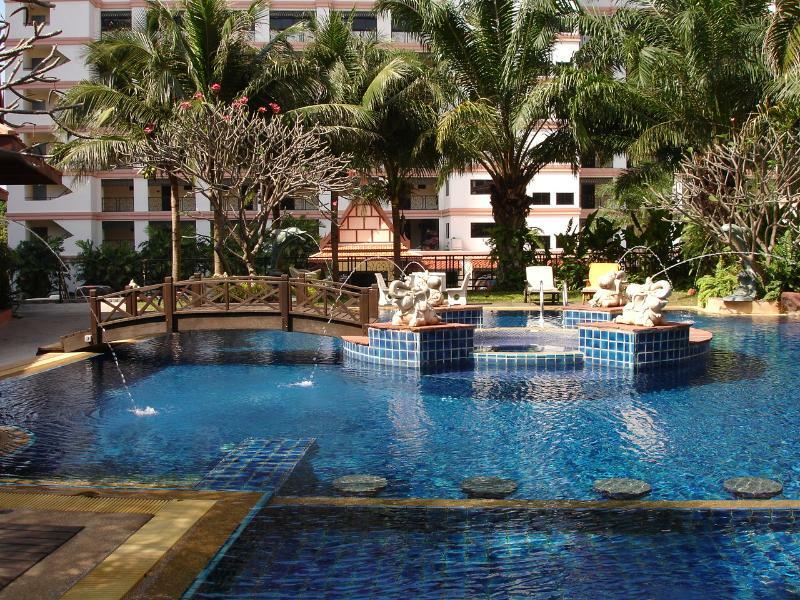 There is lovely pool with cascade, water features and central whirlpool. Parking is available at the rear of the property and there are shops on the ground floor including a laundry and small general store. There is a reception desk with friendly staff to help with any queries and 24 hour security. Stayed here for two months jan/feb 2013.its a very nice and comfy studio around two kilometers north of pattaya .the appartment has everything you need for a quiet stay with the hub bub of pattaya a 100-200 baht bus ride away.the swimming pool and garden are first class and very rarely too crowded.the studio has a balcony with a partial sea view owing to building work taking place in front of the appartment which did not bother us ,air con and a very handy fan.bathroom fine with plenty of hot water .no washing machine but a very good launderette downstairs t shirt 8baht shorts 15baht also a small shop as well.there is a very nice beach around 3/5 minutes walk which was nice as the the sun was scorching all day long,120 baht for 2 sunbeds and a parasol for the day.reasonable amount of restuarants 5 minutes walk all good value.all the staff at nova mirage are lovely and the manager nicky is a absolute gem with her tips and invaluable advice.if you are looking for a quiet and comfy place to stay with easy access to the bright lights you would be hard pressed to find better for your money,great value.overall we had a great stay. Situated in a peaceful location, the apartment has all the comforts of home. Coupled with great interaction with the owner, who arranged airport transfer and supplied the answers to all the questions I had, local transport, eating establishments etc.. Basically, she went out of her way to ensure that I had a totally relaxed, enjoyable holiday experience. I stayed two weeks here and couldn't be more satisfied. Any details that arose were quickly addressed. Security is good but not intrusive. Location in Naklua was ideal for the trip I wanted to have. Close enough to Pattaya for me! 10 minutes out. You don't have to focus on Pattaya anyway. Minutes from the amazing Naklua Market and the Sanctuary of Truth. Beer Bars and live music right down on the Avenue. Apartment was very nice and spacious, balcony was very good to sit out and watch the sun go down. Complex was very nice, swimming pool area was pleasant, only negative was that people went down put towels on beds and didn't return for a few hours but at the time we were there it wasn't so busy that you couldn't get beds. Area was quiet and had enough eating places around but you needed to go nearer Pattaya for more choice. Altogether a pleasant experience. You can get in touch with Ruth (the owner) through the contact form on this page. Send Ruth (the owner) an email through the contact form on this page. Alternatively, if there’s a phone number on this page, you can call them. How do I contact Ruth (the owner)? If you’ve already booked, go to Manage your holiday booking to view Ruth the owner's contact details or send them a message. Or send Ruth (the owner) an enquiry through the Contact the owner/manager form if you’d like a quote or more info first. When you pay online through the Book your stay form, a booking request is sent to Ruth (the owner). You’ll find out within 24 hours whether they’ve accepted - no money will leave your account before then. You can also request a quote from Ruth (the owner) through the contact form. The owner will email you the total cost for your dates and a link to book and pay online. Use the Book your stay form to pay provisionally online. You can pay by credit/debit card or PayPal. Ruth (the owner) will have 24 hours to accept the booking and no money will leave your account before then. Why can't I call Ruth (the owner) before booking? You’ll need to contact Ruth (the owner) to do this. Send them a message in Manage your holiday booking or through the contact form on this page. You can request to change the dates or number of people on your booking via the Manage your holiday booking page. To change your holiday dates use the Edit booking button. If you need to change the number of guests staying then send Ruth (the owner) a message. If Ruth (the owner) agrees, they’ll send you a revised quote outlining the changes. You can review and accept/decline this from the Manage your holiday booking page. You’ll have 48 hours to take action before the revised quote expires.